The Hay Barn01263 715779work01603 870304fax Self-cateringThe Hay Barn is a splendid building, which has been recently converted to the owners specification by an architect and has achieved a merit recognition from Breckland Council. 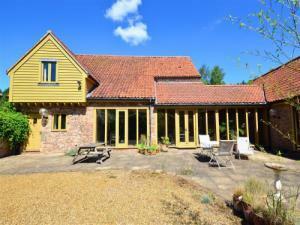 Set at the end of a private driveway, shared by 4 other properties, the Barn is located in the well known landscape of The Brecks. The property offers great character, is equipped with modern facilities throughout, comfortable areas for relaxing, a large family kitchen, a dining hall and 4 bedrooms, 3 of which have en-suite facilities. Underfloor heating, Wi-Fi availability and an enclosed garden make The Hay Barn a truly luxurious place to stay. Close to the National Trusts' moated Oxburgh Hall, the property is also a short walk from the excellent and attractive Bedingfield Arms. Surrounded by quiet lanes under big Norfolk skies, the area is ideal for walking, cycling and ornithology. Explore lovely market towns, Go Ape in Thetford Forest on zip wires and high walkways or travel to the sandy beaches of the east coast within half an hour. The Hay Barn is a splendid building, which has been recently converted to the owners specification by an architect and has achieved a merit recognition from Breckland Council. Set at the end of a private driveway, shared by 4 other properties, the Barn is located in the well known landscape of The Brecks. The property offers great character, is equipped with modern facilities throughout, comfortable areas for relaxing, a large family kitchen, a dining hall and 4 bedrooms, 3 of which have en-suite facilities. Underfloor heating, Wi-Fi availability and an enclosed garden make The Hay Barn a truly luxurious place to stay. Close to the National Trusts' moated Oxburgh Hall, the property is also a short walk from the excellent and attractive Bedingfield Arms. Surrounded by quiet lanes under big Norfolk skies, the area is ideal for walking, cycling and ornithology. Explore lovely market towns, Go Ape in Thetford Forest on zip wires and high walkways or travel to the sandy beaches of the east coast within half an hour.